Like their terrestrial relatives, marine plants are a primary food source for a wide variety of animals. The plant-eating animals are called grazers, and in an eelgrass meadow, they range in size from small (≤1 mm) snails, sea slugs, sea hares and amphipods to large water fowl (e.g. swans and geese) and even sea turtles. 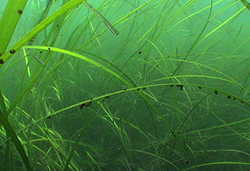 The grazer community in an eelgrass meadow can generally be split into two groups: animals that consume eelgrass (including eelgrass seeds) and animals that eat the epiphytes growing on the eelgrass blades. There are also some grazers that will fit in both categories, depending on the circumstances. It has been stated, possibly over-stated, how important eelgrass is for a variety of animals on Long Island. This is especially true of animals that use eelgrass as a food source. Animals that consume eelgrass include snails, sea slugs, sea hares, amphipods (small shrimp-like crustaceans), crabs, swans, geese and the green sea turtle. Most of these animals don’t count eelgrass as a sole, or even primary, food source, yet it is still considered part of their diet. The smallest of the eelgrass grazers often go overlooked due to their size and their camouflage. 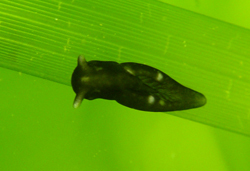 Sea slugs/hares are difficult to spot on eelgrass, unless you are specifically looking for them. Two species that we have seen around Long Island are Elysia catulus and Placida dendritica (see photos). Another group of small grazers are the amphipods. Amphipod grazing damage is distinct in that they feed on the edge of eelgrass blades, leaving a U-shaped notch. 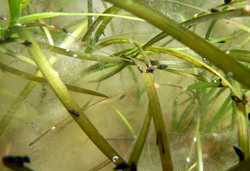 There is one snail in our area that has been confirmed to eat eelgrass, the Lacuna snail, which is discussed below in the spotlight section in more detail. Some of our larger grazers were never locally documented feeding on eelgrass until recently. 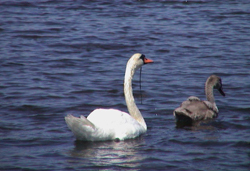 Mute swans and Canada geese (see photo) have been observed feeding on eelgrass throughout the year. The most common time of year to see waterfowl grazing in eelgrass meadows is right around the time that eelgrass seeds are maturing. Flocks of Canada geese have been seen floating over eelgrass meadows in July and August (prime time for eelgrass seeds); some with eelgrass hanging out of their beaks. Brant (a.k.a. – brent) geese on both the Atlantic and Pacific coasts are well-known eelgrass grazing waterfowl. The Atlantic population of brant suffered a significant decline after the eelgrass Wasting Disease in the 1930s, and the population has never recovered to its pre-Wasting Disease levels. Green turtles are the only herbivorous species of sea turtle to visit Long Island waters. While the majority of their diet is seaweed, eelgrass is also considered an important food source. Crabs take advantage of eelgrass seeds as a food source. Blue crabs, long-clawed hermit crabs and flat-clawed hermit crabs have all been reported to eat eelgrass seeds. It is likely that other species of crabs also will eat eelgrass seeds, and identifying these species will be the focus of future work. Not all grazers in an eelgrass meadow eat eelgrass. For some grazers, an eelgrass shoot is just the “plate that the food is sitting on.” These grazers feed by scraping the bacteria, diatoms, small seaweeds, and encrusting animals (e.g. sponges and bryozoans) off of the eelgrass shoots. In an eelgrass meadow, these grazers are most often encountered near the tips of the blades. Epiphytes tend to concentrate on the upper, older sections of the blades where the plant’s defenses are presumably reduced with age and epiphytes have had a longer time to grow. Snail epiphyte grazers include the species that eat algal epiphytes (mud snails, periwinkles, Lacuna, and Bittiolum) as well as the sponge-eating lunar dove snail Mitrella lunata. It should be noted that Bittiolum does not include Long Island in its reported range. This species, while common in the Chesapeake Bay and further south, was collected and identified from Great South Bay in the summer of 2007 and is likely a summer incidental species. 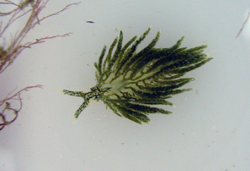 Sea slugs/hares (see above for species) are a cross-over group that has been observed to consume eelgrass, but most likely depend on epiphytes for the majority of their diet. The orange, marine flatworm, Polychoerus caudatus, has been observed on eelgrass around Fishers Island and is likely feeding on the bacterial and microalgal biofilm on the blades. 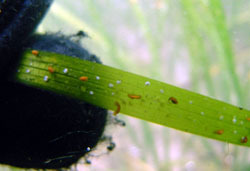 Several species of amphipod may be found grazing on eelgrass epiphytes. Three species of local amphipods that have been identified as epiphyte grazers on eelgrass include Gammarus mucronatus, Lembos smithi and Ampithoe rubricata. 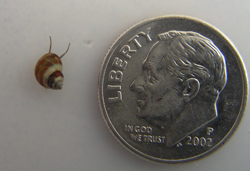 One of the most common grazers in Long Island eelgrass meadows is the Banded Chink Snail, Lacuna vincta. These small snails (1-3mm in diameter) can be so abundant in a meadow that the shear weight of their numbers bow-over eelgrass shoots (see photo). Lacuna is one of the species that will graze on epiphytes when they are abundant, but these little snails have no aversion to chewing on eelgrass blades when epiphytes are lacking. Little is known regarding the significance of Lacuna as an eelgrass grazer. Long thought to solely be seaweed grazers (Lacuna are especially fond of kelp and sea lettuce), there has only been one published report of Lacuna actually consuming eelgrass. There will be a student working with CCE in July 2008 that will be looking at the feeding preference of Lacuna. She will hope to determine what food source that snails prefer given clean eelgrass blades, epiphytized eelgrass blades, green algae (Ulva lactuca) and brown algae (Laminaria saccharina). The study will also determine potential grazing rates on the different food sources and by different size classes of Lacuna. We look forward to this project answering some outstanding questions regarding the role of Lacuna in our eelgrass meadows. The decline of eelgrass along the Atlantic seaboard resulted in the “first historical extinction of a marine invertebrate in an ocean basin” (Carlton et al. 1991). 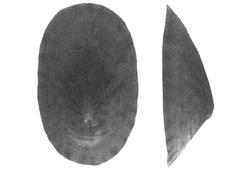 The now extinct invertebrate is the eelgrass limpet, Lottia alveus. The eelgrass limpet was a specialist grazer, consuming eelgrass tissues and only residing in areas of high salinity (i.e. marine versus estuarine). This specialization contributed to its decline and eventual extinction after the outbreak of the eelgrass Wasting Disease. In the early 1930s, the Wasting Disease epidemic led to the loss of an estimated 90% of the eelgrass in the North Atlantic. The hardest hit populations seemed to be those in higher salinity waters, with lower salinity, estuarine waters acting as refugia from the disease for eelgrass. Unfortunately for the eelgrass limpet, the sudden loss of high salinity eelgrass meadows and its inability to tolerate lower salinities left this species with a much reduced and fragmented habitat. 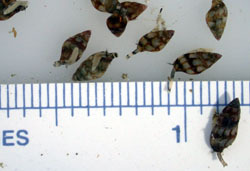 The limpet populations would have slowly declined in the years following the Wasting Disease as the planktonic larvae found few eelgrass meadows to settle in. There have been no recorded collections of the eelgrass limpet since 1929 and several surveys post-Wasting Disease failed to find any of the once abundant limpets, leading scientists to conclude that the species has become extinct. Carlton J.T., Vermeij G.J., Lindberg D.R., Carlton D.A. and Dudley E.C. 1991. The First Historical Extinction of a Marine Invertebrate in an Ocean Basin: The Demise of the Eelgrass Limpet Lottia alveus. Biol. Bull. 180: 72-80.